Winter of Grace was announced yesterday as joint winner of the 2009 Children's Peace Literature Award, together with Audrey Goes To Town by Christine Harris. affiliations for young people trying to understand the world and human relationships. intrigued with action and controversy and what might happen next. code of behaviour. Bridie comes to realise she needs to think and explore for herself. people to disagree about religious beliefs without damaging their relationship. So now I feel all warm and glow-y inside. And very pleased to have some further evidence that the Girlfriend Fiction books are "not fluff. Not at all." Why do you feel compelled to make the lids of your bottles/jars etc ever-so-slightly rounded? If the tops of the lids were flat, I could turn the bottle/jar etc upside down and let the last of the product within trickle down to the top, so that I could squeeze it out and use it. A rounded lid-top compels me to throw away the bottle/jar etc with a goodly portion of its contents unsqueeze-out-able. This is extremely annoying. Surely you haven't deliberately designed your bottle/jar etc thus, forcing the consumer to purchase a replacement bottle/jar etc prematurely. Surely not? Earlier this week I was proud and pleased to learn that Winter of Grace has been nominated for the 2009 Children's Peace Literature Award. This is a prize awarded every two years by Psychologists For Peace to a book for children "that encourages the non-violent resolution of conflict or promotes peace at the global, local or interpersonal level." What made the news especially delightful was that Penni's book, Josie and the Michael Street Kids, was also nominated, along with half a dozen other worthy titles. It's lovely to be short-listed together, particularly for such different books, and for such a wonderful award. Josie, a firm bedtime favourite at our house, is the story of a girl who moves to a new neighborhood and gradually makes friends with the other kids in the street (we love this book especially dearly because we know that Penni based "Michael St" on the street where we live!). 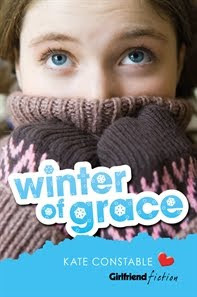 Winter of Grace is a young adult novel, about a teenage girl whose search for spiritual answers turns her world upside down, and sets her in conflict with her mother and her best friend. It's not a novel that I expected many people to read (can I say that?) but the journey of writing it was one of the most challenging and fulfilling I've experienced, and I'm so quietly happy that it's earned this recognition. Congratulations to all the nominees, and (how can I not say this?) peace be with you all. Caught part of an interview with the wonderful Don Watson on The 7.30 Report last night. The admirable Mr Watson has been conducting a campaign for some time now against what he calls "weasel words" -- the kind of meaningless corporate-speak that clogs our airwaves, our newspapers, our workplaces and even our classrooms and football fields. He pointed out that kids in Grade 2 now have to write their first mission statements; eight year olds are being asked to evaluate their key performance indicators. I winced; this is all too true. However, I must disagree with the fabulous Mr W on one point. He claims that all this jargon (value-adding, birthday-ing, lines of sight, synergies*) is burgeoning and multiplying in the name of efficiency. No. It's arse-covering. No-one wants to be held responsible for anything. If no-one can understand what you say you're trying to do, it's that much harder for someone to realise that you haven't done it. So we all float around in this cloud of vagueness, in the foggy foggy forest of weasel wordage, where no one says what they mean and no-one ever has to take the blame for anything. *Michael, who works for...er, the government... can supply me with plenty of examples. I was vegetarian for about ten years. Not that I had particularly strong ethical views about the rights and wrongs of eating animals, it was just what all my (more strong-minded) friends were doing and it was easier to go along. The cooks in our share houses were always vegetarian; vegetarianism, even now, seems to be a default position when I think of meals. It astonishes me when my father, for example, hurrumphs about a meal being incomplete without meat. Pasta, curry, risotto, frittata, soup - what could be easier than putting together a meatless dinner? Michael was a vegetarian, too, and stayed one long after I'd lapsed back into my evil bacon-and-sausage eating ways. It was having children that brought him undone. The temptation to finish off that abandoned sausage roll or shred of chicken on Alice's plate was just too strong. Ironically, now we're both full blown carnivores again, it's the girls who turn up their noses at meat. Alice's crossbite makes it almost impossible for her to chew on anything, and she objects to food that looks like it came from an animal (I entirely sympathise with this position, having some residual squeamishness myself). Evie likes warm chicken only, and Nana's roast lamb, and otherwise isn't interested, though they will both eat mince. My lack of cooking practice means I'm nervous about cooking big hunks of meat like roasts, and anyway, we get bored before we can eat it all. So we are not a big meat-eating household. I have to make an effort to include meat in our meals, rather than leave it out. Shepherd's pie, meatballs and lasagne get a big workout on our menus. These days I feel bad about meat-eating on environmental grounds rather than animal cruelty. Save the planet, have one vegetarian meal a week! I heard on the radio the other day. ONE vegetarian meal? A week? If it's that easy, why isn't everyone doing it? And yet there are people like my dad, who can't really come to grips with any form of protein that didn't once have a face. Friends in Scotland once planned to open a vegetarian cafe in Edinburgh (this was in the early 1990s); there was no such thing in existence then, and they met so much hostility and disbelief that they eventually gave up the project. (This from the city that invented the deep-fried pizza slice.) At college, our ex-army cook was so baffled by student requests for at least one vegetarian option at each meal that he resorted to eggs every night, and, on one memorable evening, served up a curry made from the fruit scones left over from that day's afternoon tea. There's something to be said for the belief that if you're going to eat it, you should be prepared to kill it. I know I'm a coward; I don't want to have to think about what the poor animal goes through before it reaches my plate, let alone actually wield the knife myself. But animals do eat each other, and I don't have a problem with that, as such. I don't want to have to grind my own flour, make my own cheese or pick my own oranges either; is it more wrong to out-source meat production than any other food? Do I have an ethical stance? In the end, it's easier to eat the little bits of incidental bacon on top of the roll, make the soup with chicken stock, throw some chorizo into the risotto, than make the effort to be purely meat-free. There are philosophical tangles here that I will have to face at some point (when Alice starts to quiz me, which will happen any day now). In the mean time, I've got some fruit scones to curry. Bon appetit. The blog of Kate Constable, children's and young adult author. Adventures in reading, writing and reading aloud. Among other things.